Taigh Druim, gaelic for Ridge House, most definately has the “wow factor”. A traditional property from the exterior, but the inside has been finished and furnished to a very high standard in a modern contemporary style. 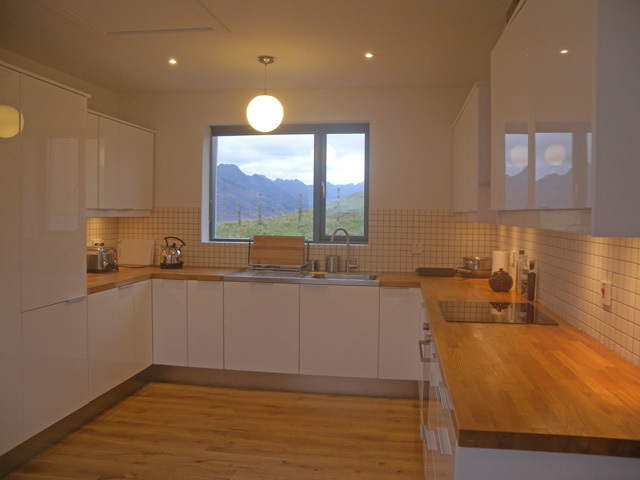 The views from Taigh Druim are truly outstanding, the Isles of Soay, Canna, Rum and Eigg can been seen from the large windows in the lounge and the view of the Cuillin from the lounge is simply stunning, no matter the weather here, you will not be disappointed. You can view more details and additional pictures and a video of the property here. Elgol is at the end of the road – a small crofting and fishing village on the Strathaird peninsula – a perfect place to relax and unwind. The village lies at the foot of the Cuillin and boat trips are available from the harbour to Loch Coruisk in the heart of the Cuillin. During your boat trip, you may catch sight of dolphins, porpoises, whales an even basking sharks and a rich variety of sea birds which could include sea eagles and golden eagles. Elgol is the ideal for walkers and climbers, you don’t need to take the boat, you can walk into the Cuillin also. Canoeing and kayaking are also a popular activity here. The village has a small shop which provides some basics, however we recommend you stock up with everything you need for your stay in Broadford. Coruisk House the local seafood restaurant, uses the locally caught shellfish on its menu. The café in the village is a welcome haven for visitors and it also has a gallery displaying work by local artists, the views here would certainly inspire any would be artist. Broadford is the nearest village to Elgol and has a selection of shops - supermarket and petrol station. Many craft shops including Skye jewellery and a number of pubs and restaurants. Portree the capital of Skye has a fantastic visitor centre, The Aros Centre, with a cinema, restaurant and large craft shop. There is much to see and do during your stay on Skye – The coral beaches around Dunvegan and a visit to Dunvegan castle – the clan seat of the Macleods. Neist point on the west coast has stunning views and on a clear day you can see the Outer Hebrides, although you can see them from most of the coastline. 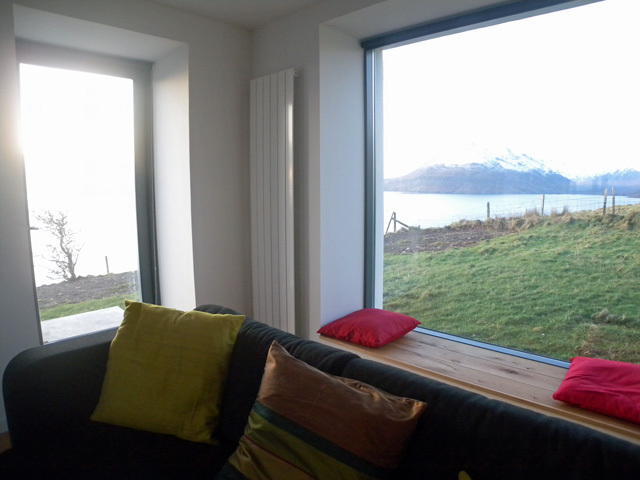 Lounge with a large windows overlooking the sea and the Cuillin. Wood burning stove. Digital TV, Ipod docking station, DVD, CD, radio also with a selection of DVDs and books. Comfortable seating for six people. Dining room - table and seating for 6 and a wood burning stove. The kitchen is very spacious and has been fitted with an electric induction hob, electric oven, microwave, dishwasher, washing machine, tumble dryer, fridge/freezer. A selection of cooking equipment and all the usual crockery will be available. Ironing facilities. 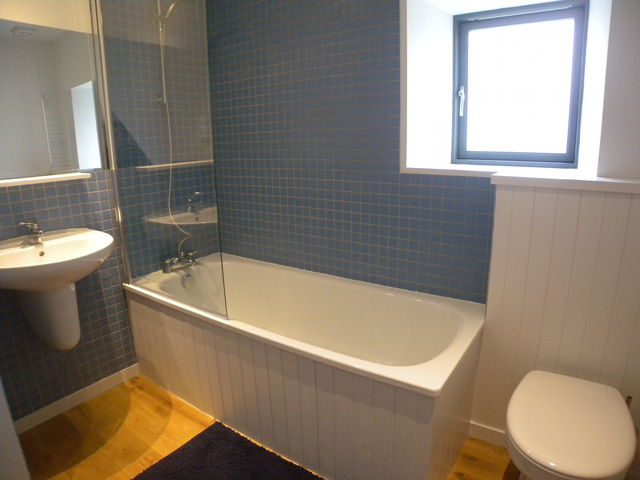 Bathroom has bath and shower over, whb, wc, heated towel rail. 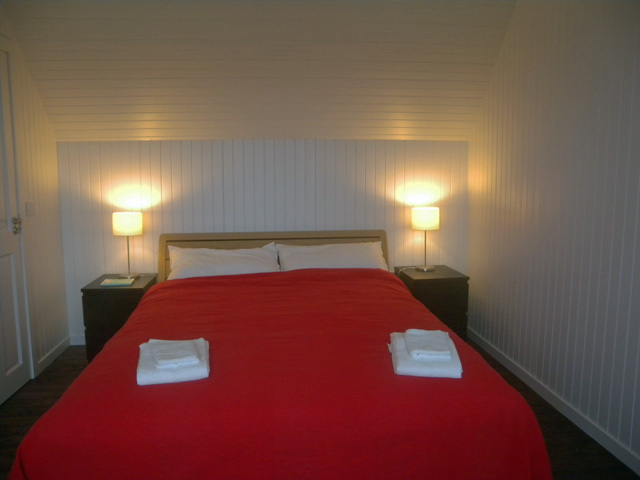 King size bedroom, double bedroom and twin room. All the bedrooms have sea views. Hairdryer. Shower room with whb, wc, heated towel rail. Electricity and logs for the fires. Outside storage for bikes, canoes etc. Decking area with the most amazing views. A Good Housekeeping Deposit of £100.00 is required at this property. Lovely, well equipped house in beautiful location. House was warm and inviting and we loved being able to look down on to the water and across to Loch Coruisk from the patio and the from the windows. Loved the wood burning fire and the easy access to walks. For our first family time in Scotland, we chose the Isle of Skye and for our first visit on this island, we chose Taigh Druim. Expectations were high on all accounts and they were met a thousand times! What a fantastic property! We love the modern style of the house with those exceptional panoramic windows as well as its colourful decoration. Everything is provided for the comfort and the relaxation of the guests from the comfortable beds, the wood burner, entertainment (books, music, DVDs and board games) to the very well appointed kitchen. We even had the delight to discover a well-kept dry food cupboard. The outide deck is ideal for yoga/Pilates sessions and we could only imagine a hot tub to enjoy at the end of a hiking day. All in all, we are very impressed and we already re-booked the property for 2 weeks next year. We enjoyed the time very much in the house and would like to come back. It was clean, cozy and well equipped. (some of the frying pans should be replaced). We had everything we needed and can highly recommend the place and the house. Best regards. I had wanted to stay at Taigh Druim for 2 or 3 years, having seen the excellent reviews on the Wilderness Cottages website, it looked fantastic. So when we arrived in September 2017 I was slightly concerned that it may not live up to my expectations. Well it certainly did and more so, because nothing can prepare you for the sheer magnificence of the scenery, no photograph can ever quite capture the grandeur of actually being there - just stunning. On top of that, the house itself is superb and very well equipped. 5 star recommended without hesitation. 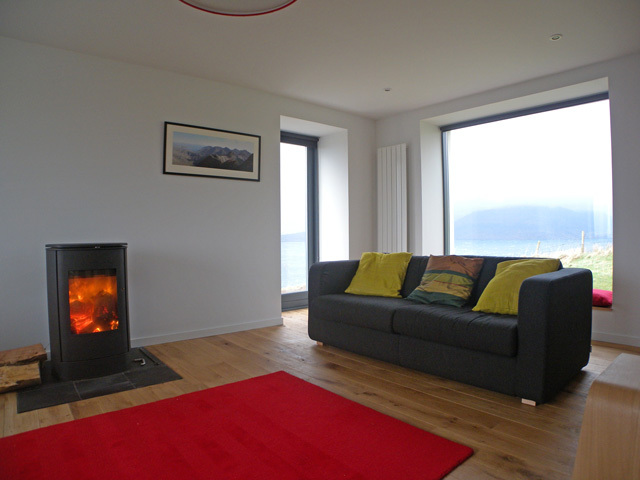 Taigh Druim is an exceptional holiday home , spacious,well equipped and very comfortable. 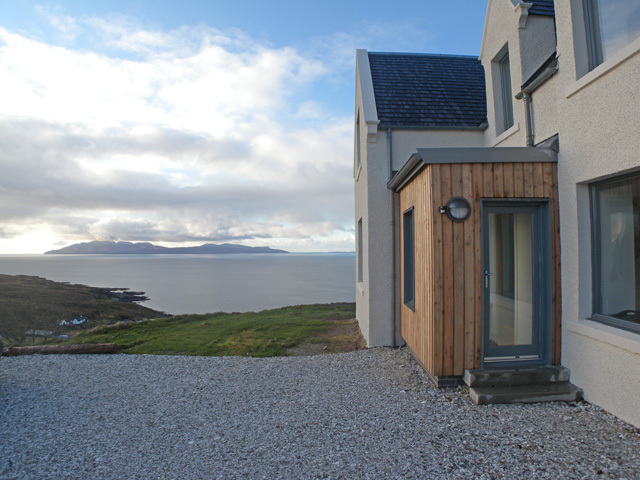 The views to the Cuillin and out to the islands are quite stunning,and to sit out on the deck on a warm evening with a glass of wine listening to the waves below and the call of the birds is the stuff of dreams! Perfection. As usual everything was just right even the weather. This is our 5th visit and we are never disappointed. Just one small point. As we are an all male group it would be preferable to have another twin bedded room. Wonderful cottage. Exactly as described - if not better. Stunning views, beautiful setting, immaculately furnished. Comfortable, clean and relaxing. We will definitely be coming back to Taigh Druim. What a beautiful house in an amazing location! We spend 5 days there and wished we stayed longer. As we had a baby and a toddler with us, we weren't able to do much walking and exploring. But the house offered everything we would have wanted so we enjoyed staying in, with the wood burner going , watching the sea and admiring the most fantastic views! Beds were very comfortable we slept very well! Don't worry about bringing any board games-plenty at the house and great variaty. Would recommend to everyone wishing to holiday in Skye! AMAZING! Simply stunning location and the house is excellent inside and out. Very well equipped and presented. Ideal base for a Landscape Photographer exploring the area like myself. We had a fantastic week !!! Four seasons in 1 hour, but every minute beautiful. Also good weather. Boat trips, the see, the mountains, birds, dolphins, seals, we had a great time. The house is very warm, well equiped and with superb views. I really recommend this beautiful house and surroundings. Location, location, location. Taigh Druim is in a fabulous location. Get the good weather and the views to the Cuillins are the best. Get the bad weather and you can be cosy inside and look out of one of three great views which, when we were there, each had different weather going on. Elgol is a lovely place to be. The 5 of us spent 2 beautiful weeks in a house with stunning view on the sea and the small islands just off the coast. The house itself very comfortable and well equipped with room and space for good an bad weather - in July 2014 just 2 or 3 days of fog, rain and wind to make the difference to the days of mediterranean climate! Marvellous hikes in the surroudings possible or just relax on the terrace, reading a good book and letting your eye wander over the water or a boat leaving or coming in. Taigh Druim has been completely refurbished and lacks for nothing. The view to the Cuillns is the best in the British Isles without question. The weather was good, even dry! I would throughly recommend a stay there. This is the second time that our group has stayed here and we're already planning the third!Fantastic cottage, couldn't ask for better! We stayed in Taigh Druim during the second week of October. Lots of rain and strong winds but, we were also able to sit outside in the sun with a cup of coffee! Fantastic views, a wonderful property that was beautifully warm and would definitely go back. 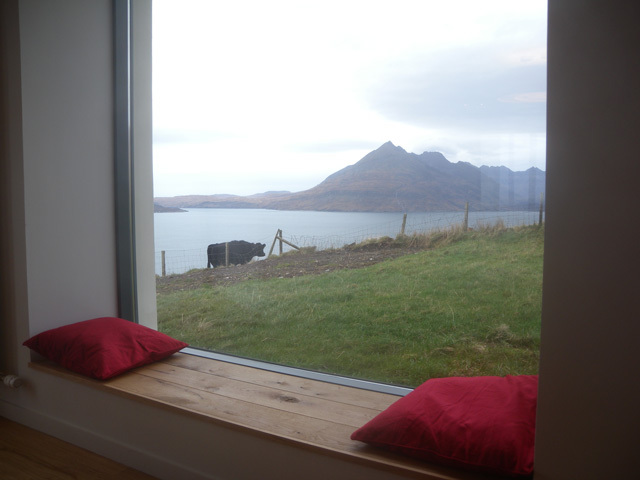 We stayed at Taigh Druim in Elgol for a week and had a wonderful time. The house itself was beautiful, clean and had all the facilities you could ask for. The views were stunning and there was lots to do with a family in the area and beyond. One of the best houses we've ever stayed in in Scotland. 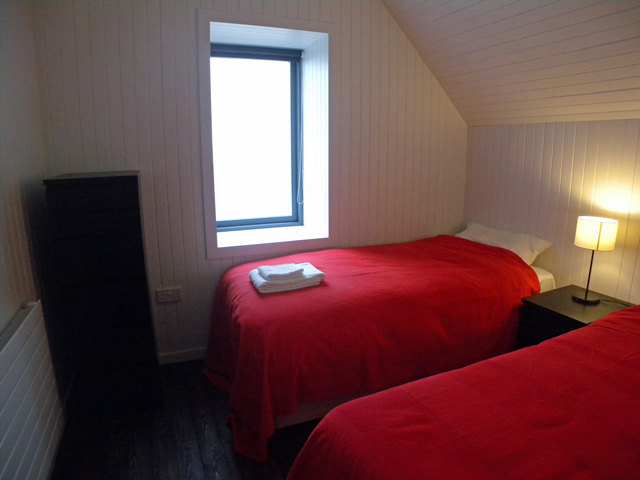 We stayed at Taigh Druim in late August-early September. It was one of the most beautiful places we have ever stayed in. The house has been renovated beautifully and has magnificent & breathtaking views of the mountains and sea. It is fully outfitted with everything you could possibly need for cooking and washing clothes, plus many walking & climbing books. Really just a fantastic place to base yourself for walking, climbing or relaxing and just looking at the views. We were very happy with the cottage in which we stayed and with the service provided with Wilderness Cottages. 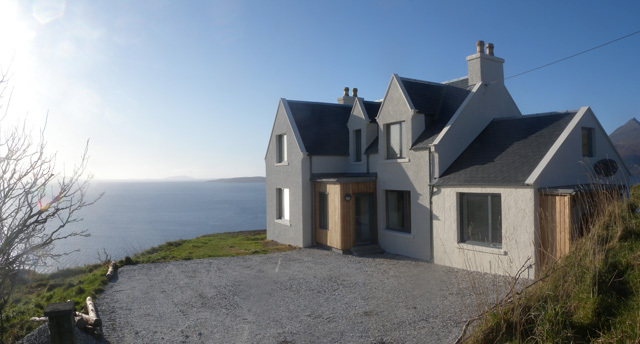 Taigh Druim was as described - in a spectacular location, clean, comfortable and generously provisioned. In fact we were so happy there that we've already booked to come again next year for two weeks - and that's all the way from Australia. We enjoyed our holidays in Taigh Druim very much. This cottage is really great. We seldom found such a perfect place: Absolutely comfortable cottage, amazing view to ocean and islands, wonderful environment, ... . We are sure, to come back later to Elgol. Thank you very much for your perfect support in booking this cottage. We really loved our stay at Taigh Druim. The house is beautifully appointed and thoughtfully equipped for visitors. The views from the house over the Cuillen are truly magnificent and ever-changing. Elgol is remote, peaceful, but with the added bonus of an excellent local restaurant and the opportunity to do some wonderful boat trips around the surrounding isles. We will definitely be back! We booked this cottage for a week in May 2010 on recommendation from Corinne as it had not even been released on the website. It is located 15 miles down a single track road to Elgol but on arrival we were speechless!! The views were amazing - sea, mountains and islands! Internally the cottage was of an extremely high standard and every detail had been thought of and catered for. This was the most amazing cottage and location - we have booked again for next year as we dont want to miss out! Read a comment somewhere 'when God made Skye he was showing off' perhaps the writer was looking out from Taigh Druim. Accomodation first class, we very much enjoyed our stay. Be sure to stock up with food and drink before arrival at Elgol. 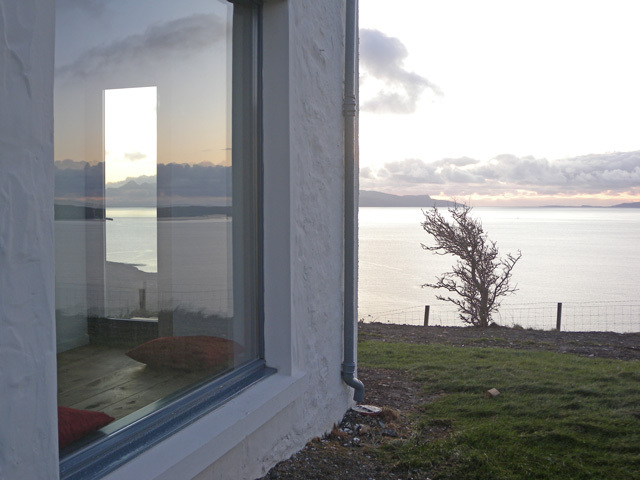 When you first arrive at Taigh Druim you have to catch your breath at the view - can it get any better than this - well as you walk inside the house it does. 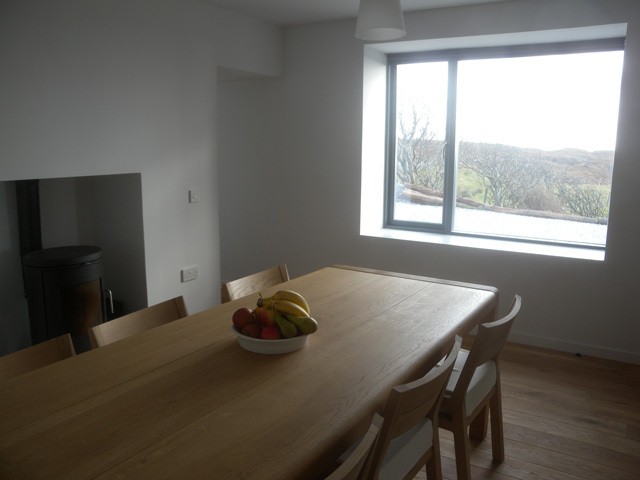 David Bann has made Taigh Druim a modern, comfortable, spacious and "never wish to leave it" property. And the view of the Cuillins from the picture window in the sitting room, well, as I said to my wife when I stepped in the room " have I died and gone to heaven". It is brilliant, and that's an understatement ! What a find.